Hundreds of delegates attended the 2010 IAM Legislative Conference in Washington, D.C. 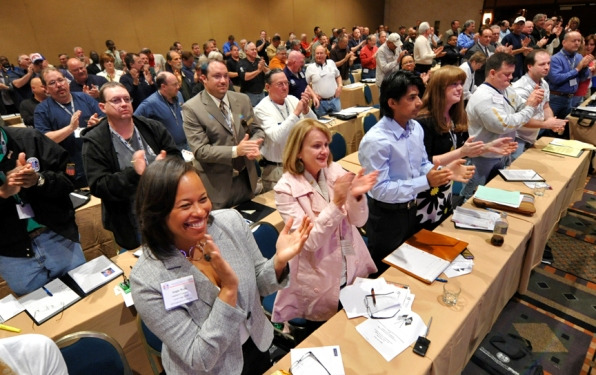 The 2011 IAM Legislative Conference is set for May 9-12 at the Hyatt Regency in Washington, DC. The Conference kicks off Monday afternoon at 1:30, with opening remarks by Headquarters General Vice President Rich Michalski, who will serve as permanent chair. IAM President Tom Buffenbarger will deliver the keynote address. Delegate registration will be held Monday, May 9, from 9:00 a.m. until 12:30 p.m. and from 8:00 to 9:00 on Tuesday morning. The cut-off date for reduced room rates is Thursday, March 31. Call the hotel directly at 202-737-1234 to make your reservations.